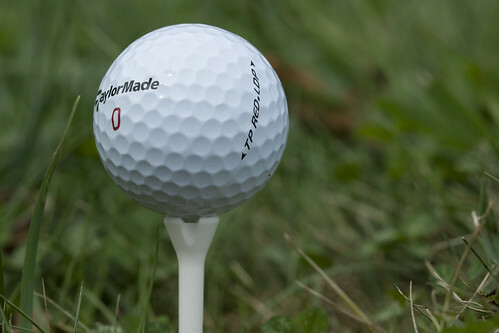 Twenty years ago players probably put very little thought into what they would use to tee up their golf ball. Heck, most people today probably do not think about it. Evolve Golf has…and they have introduced two products to this arena over the past several years. As some of you may already know, Evolve Golf has made some waves by offering increased ball speed and better spin numbers to users of the Epoch performance tee. 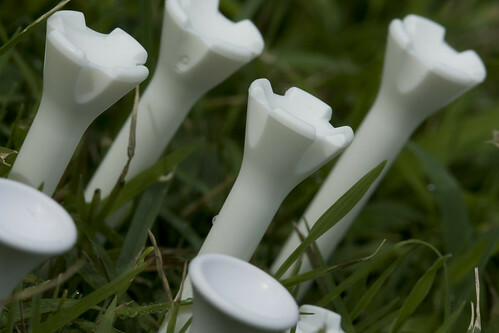 This year, Evolve Golf has created the Vireo-S3 for those golfers looking to leave a few less broken wooden tees on tee box and to infuse a little technology into their tee game. Today we will have a closer look at both of these products. We will start with a little information from Evolve regarding the products and then continue on with our detailed product review. 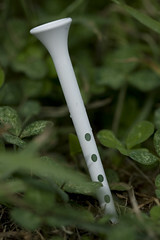 This review has numerous photographs of the Evolve golf tees, please click on the images to see a larger photo. 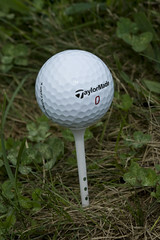 The Epoch is the only performance tee with radius posts that span the width of a golf ball dimple. This unique feature creates the lowest coefficient of friction of any tee, eliminating deflection at impact and increasing ball speed and control off the tee. Epoch tees are available in three lengths 3Â¼”, 2Â¾”, and 1Â½”. You can choose either the 3Â¼â€ or 2Â¾â€ length depending on the size of your driver and your personal depth of insertion preference. The 1Â½â€ Epoch is designed specifically for fairway woods, irons and hybrids. Since being introduced in 2004, the Epoch has racked up well over 100 wins on tour. PGA: 44 Wins, LPGA: 31 Wins, Nationwide: 26 Wins, Champions: 18 Wins. 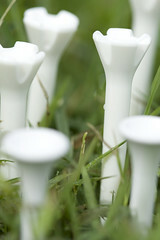 Vireo-S3 golf tees represent the intersection of tradition and sustainable design by Evolve Golf. Vireo-S3 tees feature a smooth rolled edge. The cup of the Vireo-S3 is slightly wider and deeper than the typical wooden tee making it easier for a golfer to tee their golf ball. The Vireo-S3 is also the first Evolve Golf product to feature the new Sweet Spot System (S3). Consistently hitting your driverâ€™s sweet spot delivers the maximum amount of carry distance and roll. Incorrect tee height creates improper ball flight resulting in a loss of distance. 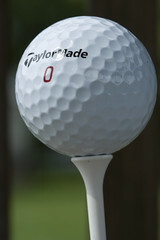 Evolve Golfâ€™s Sweet Spot System takes the guess work out of consistently teeing up your golf ball. The Sweet Spot System aligns the height of the ball with your driverâ€™s sweet spot so that you get the most distance out of every drive. The Sweet Spot Systemâ€™s depth of insertion guide is available on the Vireo-S3 (available now) and the Epoch-S3 (coming soon). 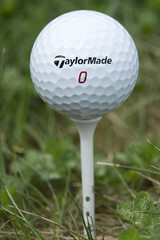 Evolve has put together a nice little web based tool to help you find the mark to use on the side of the tee. 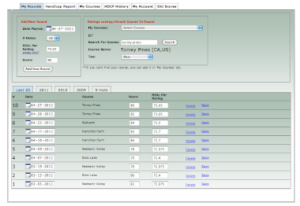 Check out their Sweet Spot System Calculator and see how many dots should be showing when you tee up your golf ball. I have been playing the Epoch golf tees for the past year and, while I may not actually notice a direct improvement in distance, I do feel more confident over the ball on the tee box. I will try and blind test here and there, teeing up a ball on a wooden tee and then an Epoch, Vireo-S3 or some other brand of performance tee. I hit away, trying to gauge the results best I can, but without an Iron Byron swing and a Trackman at my disposal it is tough to say that any one tee is better than the other. Evolve Golf, and plenty of other independent labs that do have that equipment have tested these tees and will tell you that they do indeed perform better. Evolve has even put together a page to show you relative performance gains based on your swing speed. It turns out to be a couple yards and some decent reduction in side spin, certainly nothing your eye could notice, but the gains do seem solid…and quite surprising from something as simple as a tee. I will tell you this, at least mentally I am convinced they help the ball perform better. It may just be in my head, but I do feel more confident when I have teed my ball up with one of the Epoch tees. I even go so far as to use the short Epoch tees on my Hybrid or Iron tee shots. More important to me, and this starts to lead into the Vireo-S3, I like being able to just take a couple tees in my pocket and use the same ones all round. Through this season, I think I have gone through 6 Epoch tees, and that is mostly because I have simply lost them…either fell out of my pocket (whoops!) or just couldn’t find it on the tee. Only once have I had an Epoch actually break on me. At first I thought it was pretty silly to want to pay a lot of money for some performance tees, when I generally can just grab a handful of the old wooden ones whenever I need in the pro shop. But, now, when I take 2 or 3 tees with me…and leave the course with all them…I find myself noticing how many broken wooden tees litter the various tee boxes. I am doing something to help the environment…right? The Vireo-S3 sacrifices some of the technology and performance benefits of the Epoch tee, but still seems retains the durability and longevity. With the introduction of the S3 dots on the bottom of the tee, you can feel a little more confident in your ball height on the tee box as well. I have been using a couple Vireo-S3 tees for the past 8 weeks or so, and have only managed to break one of them. That happened to be an absolutely awful swing with a driver that ended up cracking the little cup where the ball rests. It certainly was not a good swing and probably would have shattered just about anything under there! Speaking of the little cup, it does do a nice job of holding the ball up. With some of these performance tees it is difficult to get the ball to sit right on the tee, not so with the Vireo-S3, piece of cake. I played around with the tee height markers (S3) on the range for an afternoon until I found a height that worked well for me. And now it really is pretty stupid simple when you get up to the tee box, push the ball/tee down until it hits that mark, and then I am not worrying about whether or not the ball is tee’d up too high or low. Simple thing…but as we all know golf can be so darn mental! 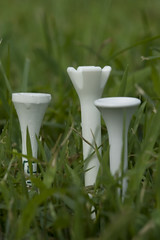 The S3 marks should be available on the Epoch tees in the near future, which will be great! One little side story, my wife and I played this weekend with a random single we caught up to on the 3rd hole. He was struggling with his driver a bit, was missing a lot of fairways. Around the 11th tee I gave him one of the Vireo-S3 tees, told him a little about it, and about The Deep Rough and all. He thought the idea was a little hokey, and ended up putting the tee in his pocket. Well, we continue on, still no fairways. Finally, on the 17th tee, he pulls the Vireo-S3 out, tees it up and proceeds to smoke one down the middle. Honeymoon? Perhaps. “These results are not typical”? Most definitely. But, anyway, he was impressed. If you play a lot of golf you know how many wooden tees you go through a season. Are they cheap? Yes. 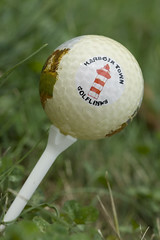 Do they leave little marks on the bottom of your driver? Yes. Do they litter your tee boxes on a Sunday afternoon…no doubt. If you are a low handicapper, have a consistent swing and are looking to eek out a few yards from your clubs, the Epoch tee is a great idea and has proven itself on all of the major professional tours. You can purchase a combo pack of 50 Driver length and shorter iron/hybrid length tees for $6.99. With 50 Epoch tees…I cannot imagine you will have to buy any other tees again anytime soon. You could probably outfit your foursome with tees for the next season or two for $6.99, how can you go wrong? If, on the other hand, you are a casual weekend golfer, and are just looking to eliminate the need to purchase golf tees again for the next few years, check out the Vireo-S3. 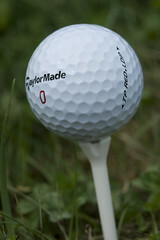 You can pick up a package of those for $5.99 at your local golf retailer. The little S3 marks on the tee could help give you that little extra bit of confidence you need to stripe your drives down the fairway. Also, check back tomorrow as we will be starting up our September Deep Rough contest, where we will be giving away some Evolve golf tees along with some other great golf equipment, including the recently reviewed Heavy Putter Mid-Weight! Durability can also translate into eco-friendliness. I have been playing with a golf tee created from corn and it just won’t break! 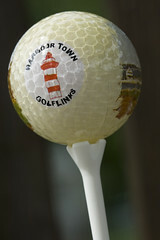 Turning Stone Resort (for one) sets out these golf tees for their hotel guests.